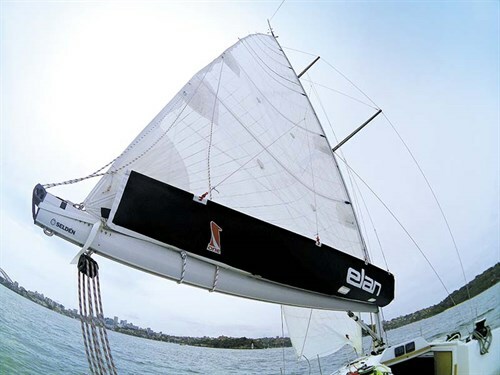 Formerly known as the Elan 320, the newly rebadged E3 came about when the company renamed its entire range last September into three abbreviated categories: the performance cruising sailboat Elan E series; the performance enhanced Elana S range; and the performance premium Elana GT range. The first Elan E3 to arrive was at the Sydney International Boat Show where I enjoyed looking over its angular lines. 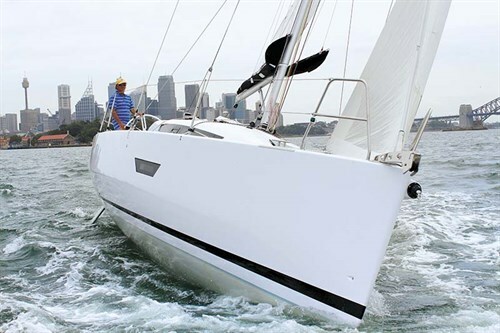 The Volvo 70 raceboat-inspired hull is set off with hard chines, tall topsides and the obligatory beam aft which creates a rather boxy shape, given the relatively short 31-foot length. However, the shape creates volume and form stability, so its day job of being a family cruiser can work, while the chines tuck in the aft section nicely to reduce wetted area and when heeled, promote tracking. 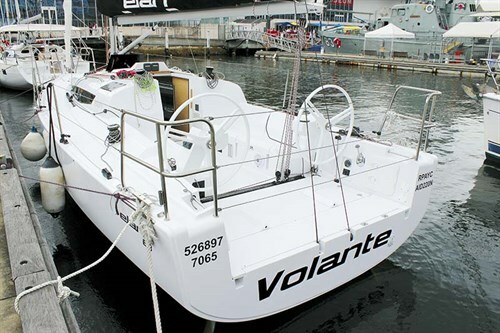 The same recipe certainly worked for its older sibling the popular Elan 350 that was voted European Yacht of the Year. 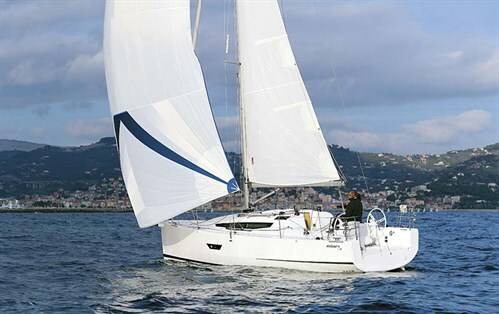 The key ingredients that give the Elan E Series range its oomph are: a bulbed keel for high stability, rockered hull for nimbleness and twin rudders for managing the beam which is reduced by those chines. 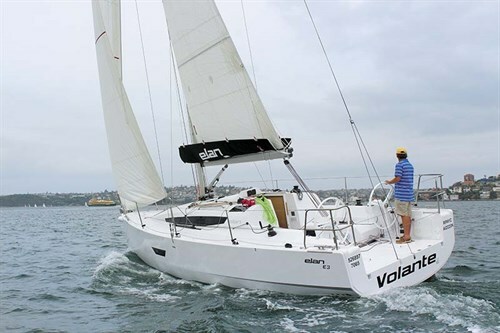 Running the numbers on the Elan E3 shows she’s lively on paper – with a SAD ratio of 22.66 and displacement/waterline ratio of 157.76 – which compares favourably with her direct competitor, the Jeanneau Sun Fast 3200. For her IRC rating, I was shown a trial certificate showing a TCC of 0.991, so again up there with the older Sun Fast 3200. Standard features on the Elan E3 should be adequate for most performance sailors though and begin with the large and deep cockpit for race crewing. Here are plenty of practicalities including traditional washboards on the main hatch (that are stored neatly in the head), a deep bench locker and plenty of space between the twin wheels for access to the transom. Sail controls are well laid out with the mainsheet track far aft on the boom to put twist and control on the mainsail (via 3x2 blocks for plenty of purchase). The Harken 35 primary winches are placed halfway along the coaming, which is ideal for crewed trimming but just out of reach for shorthanded sailing. Usefully, the jib sheets can be finely trimmed as they run through floating rings that allow barber hauler control of the tensioning and allowing a greater variety of sheeting angles for upwind and downwind. The halyards are controlled by another pair of H35s on the cabin top, along with banks of jammers either side. The keel-stepped alloy rig is supported by standard wire shrouds and adjustable backstay via a cockpit pulley arrangement. Downwind sails – a gennaker or asymmetrical spinnakers – can fly off the retractable bowsprit. For its sail wardrobe our test yacht had upgraded OneSails bent on, including an under-deck roller-furled genoa, with conventional slab reefing on the main; giving about 10 per cent more sail area. Moving on deck gave me confidence thanks to adequate non-slip, flush hatches and effective guardrails. The pulpit area again held no surprises thanks to a deep chain locker, a recess for the optional vertical windlass and a removable bowroller was fitted, along with sizeable cleating fore and aft. Optioning to folding cleats for racing is about the only thing I’d change. Stepping below decks – made easier by a lowered companionway – brings me to the fully-fitted saloon with chart table starboard and galley opposite. 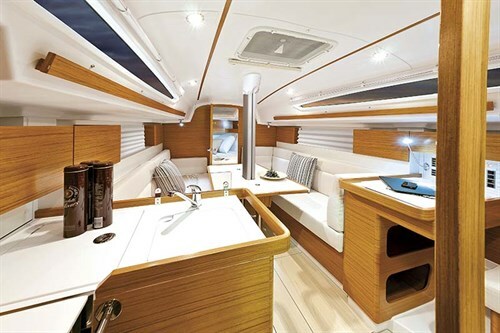 The galley on the test boat included the optional oven along with deep sink and chest fridge so is ideal for cruising, and importantly ventilation is good via opening portlightss and large skylights. In the portside bathroom is a useful wet locker at the back along with shower, manual head and is spacious for this class of yacht. The saloon is dominated by the keel-stepped mast set relatively far back in the hull. This centres the point of effort above the keel, while also supporting the foldout dining table. The lounge benches either side will easily seat a race crew or cruising family, while locker space above is commodious for long weekends. The two-cabin layout has a double berth in the port quarter and a forepeak double. The latter has two bunks with an infill and enough natural light and air from a single skylight. Unsurprisingly for a 31-footer, headroom isn’t towering here and I just managed to squeeze my 5ft10in frame in. But the bed will accommodate taller sailors and is surrounded by longitudinal shelves and a tall locker. Quality fittings are used throughout, including mostly metal catches and padding strips to quieten doors. As you’ve probably heard me say before, light winds reveal a lot more about a yacht than a good blow so the 10kt breeze wafting over the Sydney Opera House as I motored past, would do us nicely. Under power I noted the twin-blade folding Flexofold powered us to 7.1kts when the revs flattened out at 3100, with no judders felt on the wheels. The smooth ride under power is due largely to the twin rudders avoiding prop wash, so I was keen to check the common issue with this setup – reversing. However I was pleasantly surprised as the E3 tracked backwards obediently and even when turning didn’t sway off dramatically, so good for those tight marina berthing scenarios. My host for the day Matt Hayes, the boss of PCY, revealed it was the yacht’s first sail, so I anticipated some tuning issues. Underway, I was able to easily sheet the main from either helm while Matt trimmed the genoa, allowing us to point to about 30 degrees and 7.1kts boat speed. The twin rudders meant nimble handling through the turns and without obvious drag as we accelerated onto the new tack. This brand-new E3 sailed equally well on both tacks straight out of the box, as it were. Standing at the wheel the footplates did an excellent job and perched on the coamings I was able to see the telltales clearly on both tacks, with the Jefa system giving positive yet adequate feel to make steering enjoyable. All that was lacking was some twilight race yachts to test our speed against but that will happen soon, Matt hopes. Off the wind our increased wetted area slowed us to 4.5kts and with the breeze going aft of the beam I was keen to fly the kite. But with only two of us that would have to wait for another day – like an upcoming twilight race that I’m keen to be part of in this exciting new yacht, so watch this space!